The Collective Global Accelerator (CGA) is our flagship programme serving entrepreneurs and innovators from all over the world. At CGA, you’ll get the mindset, tools, and network to help you scale your social enterprise and become an extraordinary entrepreneur. If you're looking to make a difference for people in need, we can help you do just that. April 30th: First 5 participants are selected, all applicants are notified. May 30th: Last 5 participants are selected, all applicants are notified. August 7th: All participants arrive in London to start the 4-week programme. Sept 2nd: The Investor Pitch event concludes the programme. The Collective Global Accelerator is a 4-week immersive, residential experience at our co-living community The Collective Old Oak, in London. CGA 2017 brings together 10 dreamers and inspired solvers with unique skill sets, experiences, and passions, and empowers them to scale the impact of their social start-up on the world. Specifically, CGA exists to help social startups (not-for-profit and for-profit) that create opportunities for people in need in communities all over the world. If you attend CGA, you'll have an extraordinary opportunity to learn how to become a better entrepreneur; be part of a community of people who share your commitment to do good; grow into a global innovator; get access to our network of world-class experts and thought leaders, and have the opportunity to raise the funds you need to scale your venture. 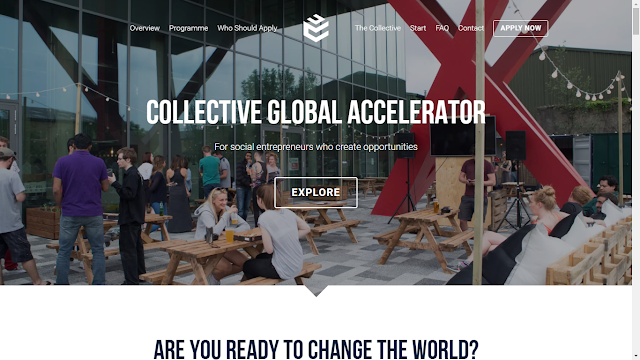 The Collective Global Accelerator is an initiative by The Collective Foundation.